Only toward the end of my dolphin-training career did I admit to myself that there's something wrong about using dolphins for our amusement. They have wonderfully rich lives of their own until we yank them out of the sea, their lives as a species going back 60 million years. I worked for a time on the Miami Seaquarium Capture Boat and used to help abduct them, kicking and screaming all the way. We brought them ashore and dumped them into an alien fantasy world -- and why? It was my job. If someone would pay me to do this, surely, I thought, it must be okay. I really thought what I was doing was acceptable. I even convinced myself that the dolphins we captured were lucky because they would be cared for by humans for the rest of their lives. And listen to the people laugh and clap their hands when the dolphins do flips in the air. Isn't that worth something? Getting worldwide public opinion on our side, getting people to see what we see at a dolphin show, that's our big goal. And we're making some progress overall, winning in some parts of the world; losing in others. If people understand our message, they'll join us. I'm sure of that. If they can realize that when we talk about “dolphin abuse,” we don't necessarily mean that they're being kicked or neglected. Being in captivity itself is abusive. For a wild dolphin swimming free, being captured and plunged into a tank that's like a teacup, how could that not be abusive? In your study of dolphins you'll find that the majority of dolphins held in captivity are Atlantic Bottlenose dolphins (Tursiops truncatus). They live in temperate and tropical waters worldwide, weigh from 300 to 600 pounds and grow to more than eight feet in length. They live in groups called “pods,” made up of from several individuals to several hundred - males usually hanging out with males, females with females and their calves - and they swim up to 40 miles a day, navigating, socializing, mating, and foraging for schools of fish. Whales (Cetacea) are divided into 13 families, which are composed of about 76 species. Four of those 13 families are baleen whales (Mysticeti), those that swim through the ocean sifting out plankton (like small crustaceans and krill) to eat. All the other families are Odontoceti, which means that they have teeth. They use these teeth not for chewing, incidentally, but for grasping. One of those families, the Delphinidae, is composed of 31 species, including the killer whale (Orca), common dolphin, porpoise, spinner dolphin and the bottlenose dolphin, ( Tursiops truncatus ), the one like Flipper. But when we see them at a dolphin show, what do we see? I'll tell you what I see. I see a dolphin eager to please and ready to do whatever the trainer wants him to. And why? Because he's hungry. Yes, dolphins perform tricks because that's when they're fed. One of the first things a trainer learns about dolphins is that they do not perform immediately unless they're hungry. This is why dolphins are fed during the show. You see the trainer blow a whistle and toss them a fish every time they do something right. And they know what they're supposed to do because they've been trained to expect a fish when they get it right. In fact they often start the show themselves when they get hungry. The trainers call their training method “positive reward.” From the dolphins' perspective, however, it's food deprivation. If the dolphins get it wrong and the whistle is not blown, that means they won't be getting any fish reward. Unless you can get your story out to the public, you will get nowhere in your campaign. You need the media for that. But don't call it “publicity.” A reporter or journalist of any media is not interested in your publicity. Reporters are interested in news or a good story. The reporter comes to you because he or she needs facts for the story. So you must deal in facts. Don't guess. Don't offer your opinion, your suspicion, or your hope as fact. And if you don't know the answer to a question, just say so. But if you know anything at all that the reporter needs to know, say that. Be helpful, and honest. Back in 1938 when dolphin exploitation suddenly burst on the scene at Marine Studios in St. Augustine , Florida , USA , the public paid a few dollars each and sat in the stands to watch dolphins do their tricks. Now they've found something much more profitable to do with dolphins. Now you can “swim” with them. It's not really swimming, of course. Customers take turns holding on to the dolphins' dorsal fins and having the dolphin pull them around the tank. My wife Helene and I monitored a swim program in the Caribbean during March of 2001. Customers entered the tank six at a time to encounter two waiting dolphins, three others on standby. The swim periods lasted less than 15 minutes each. Except for brief breaks so that the dolphins could perform in the show, the swim program we monitored was going full blast, loud techno music blaring, from 9 a .m. till after 8 p.m. But that's not all. Three photos are taken of each person swimming with the dolphins. These cost $7 each. Assuming that each of the 264 swimmers buys one picture, that's $1,848, bringing the grand total to $ 19,008 a day. Q: What about “special cases” like Make-a-Wish Kids? These are children dying of a disease like cancer, and their final wish is to swim with a dolphin. Don't they benefit by swimming with dolphins? A mistake like this is very unfortunate because it undermines your credibility. You don't' have to be a marine biologist to talk intelligently about dolphins, but you do need to know the difference between the basic characteristics of a bottlenose dolphin and a killer whale. “What is the required amount of space a captive dolphin needs in order to be happy?” is another question we are often asked by first-time campaigners. They want to use this information to argue with the authorities that the size of the facility they are fighting is too small and therefore must be shut down or at least made bigger. But any tank or enclosure is too small for a dolphin. Dolphins are free-ranging marine mammals that would normally swim up to 40 miles per day. Our work is not about making the cage bigger. It's about abolishing the cage. So the answer to the question is simple: The only habitat that meets a dolphin's space requirements is - the open sea. "If the dolphinariums only used dolphins that were born in captivity, then there wouldn't be a problem," is another typical pitfall. We are aware that some captive dolphin facilities are trying to appear politically correct by displaying captive born dolphins. But we strongly oppose captive breeding. It is imperative to consider the ethics and educational value of breeding dolphins in captivity. Some dolphins have been confined within the same barren walls of a concrete tank all their lives. They think the roof is the sky and have never experienced the simplest elements of nature, such as the natural rhythms of the sea, the sunshine, and the rain. They will never swim in a straight line for as long as they desire; nor will they ever be able to use their speed, intelligence, sonar, and sense of cooperation to catch live fish. They are freaks that we have created for our own amusement, and they have no positive educational value. Don't accept the use of dolphins in so-called Dolphin-Assisted-Therapy (DAT.) DAT has become a lucrative business over the last years and presents a serious threat to the welfare of dolphins, in that it creates further violent captures of dolphins worldwide. DAT takes advantage of desperate and vulnerable parents who pay large sums of money to give their ill or disabled children what the billion-dollar dolphin captivity industry advertises as a life-enhancing dolphin experience. But there is no scientific evidence to substantiate the claim that spending time in a tank or sea enclosure with dolphins has a healing effect on people. Even if there was, could this really justify the high price that dolphins pay for our desire to be close to them? We find that it is inherently hypocritical to capture and confine dolphins - thereby destroying the quality of their lives - in an attempt to enhance our own. During interviews and in your printed material don't let your enthusiasm exceed the facts. Neither should you assume that quoted material you've found in the media is correct. It would be correct to say that John Doe was quoted saying “Such and such” in a certain edition of a periodical, but not that he actually said it. If you need to know whether he actually said it or not, you should verify it with him directly. And even then, it would not necessarily survive cross-examination in a court of law unless you can prove it with a witness who would back you up. Watch out for libel. But don't be paralyzed by it. I'm not a lawyer, but I have a working theory about libelous statements in the United States : If you deal in facts and your motives are pure, don't worry about it. Our objective is to shut down captive dolphin facilities and stop any further captures and exploitation of dolphins. Ultimately, what we want to do is free captive dolphins; return them to the wild if possible. Not all captive dolphins can be successfully released back into the wild, of course. Some dolphins have been in captivity too long and sometimes they've forgotten even how to catch a life fish or eat one. Can we tell whether a captive dolphin can make it in the wild or not? If they succeed, they're candidates for freedom. We release them, monitor them till we're sure they're okay in the wild, and then go on to the next case. For those who are not candidates, we can try to transfer them to protective custody. Our coalition would like to establish a dolphin sanctuary for these particular dolphins. 8. Remember, the commercial exploitation of dolphins is based on supply and demand, just like any other product. If you don't buy a ticket, you won't be supporting this abuse. Tell your friends. Because a protest involves a direct contact of emotional opposites, anything could happen during a demonstration. We try to script them to keep control of things. We tell police officials in advance what we're going to do so that nobody will get bopped on the head. 3. If you have a lawyer, let him/her know what you're doing. 5. Hand out dodgers (printed only on one side) that briefly explain your position and give the group's address and phone number. If someone tosses the dodger on the ground, pick it up and give it to someone else. If they tear it up, gather up the pieces and put them in the trash. Be pleasant at all times. Looking back, we were successful in closing several captive dolphin facilities in the United States , some in Australia , Canada , the Middle East, Europe, Latin America, the Caribbean , and other places around the world. It's important to understand that protesting really works. Many times it's the only thing that works. For example, in the United States the dolphin captivity industry stopped capturing dolphins because of a small handful of protesters that were not afraid to disrupt the dolphin captures. Many of the captive dolphins in various European amusement parks - including a discothèque - were captured in the Gulf of Mexico near Pine Island , Florida . We started protesting these captures, even to the point of getting arrested, going to jail and then on a hunger strike to bring attention to the problem. This is called civil disobedience. It attracted the media who, for the first time, exposed that fact that the captivity industry in the United States was capturing Florida dolphins and selling them to deplorable facilities abroad. We called this campaign "Export Oranges, Not Dolphins." We printed tee shirts and bumper stickers with our slogan. Eventually, the captivity industry backed off and announced that they were observing a "voluntary moratorium" on all dolphin captures. The capture of dolphins in the United States was finally over. Why did this happen? The answer is simple: the media finally exposed the dolphin captivity industry. And the media only showed up because they were attracted by the protesters. The daily news is like show business, and the media is always looking for a good story. This is especially true with TV news. They want moving pictures, action and conflict. To them, these are elements of a good story. And we give it to them in a non-violent, peaceful manner. Most people who visit dolphinariums never ask the right questions. They ask things like "what's the dolphin's name," "how much do they eat," or something trivial like that. The questions that they should be asking are: "How did the dolphin get here, and how long is he going to be staying here?" 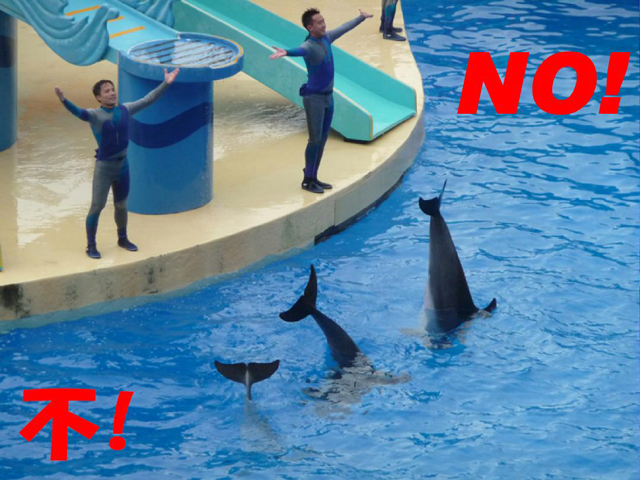 Questions like these are not so easy to answer, and these questions are discouraged by the dolphinarium. The dolphinarium will have you believe that God put the dolphins there, or they came out of the sky. They don't want the visitors to know that the dolphins they are watching were actually captured. When confronted with the fact that the dolphin was captured, they will often say that this was a "humane capture." But the concept of a humane capture is an oxymoron: There is simply no such thing as a humane dolphin capture. All dolphin captures are violent and cruel.